This young whooper is on its first fall migration, guided by an Operation Migration ultralight. Bars on its wings will fade by its next migration in spring.Required photo credit: Joe Duff/copyright Operation Migration USA Inc.
Scientists have studied bird migration for centuries, but it remains one of nature’s great mysteries. 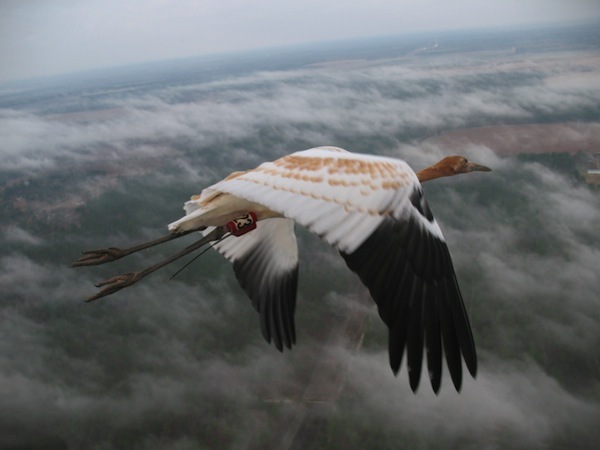 How do birds find their way over long distances between breeding and wintering sites? Is their migration route encoded in their genes, or is it learned?